Neal Elias est une légende de l'origami. Il a développé en particulier la technique du box-pleating avec son célèbre "étirement d'Elias"' et a créé un nombre impressionant de modèles. Ce DVD est la référence ultime des travaux de Neal Elias. Grâce à un travail de compilation extraordinnaire, toutes les notes et les travaux de l'artiste sont regroupés et classés. Les diagrammes inclus sont principalement ceux réalisés par Neal Elias lui-même, complétés par des illustrations et des diagrammes supplémentaires réalisés par Dave Venables, Robert Harbin, Mick Guy, Jessie Seto, et Halle. 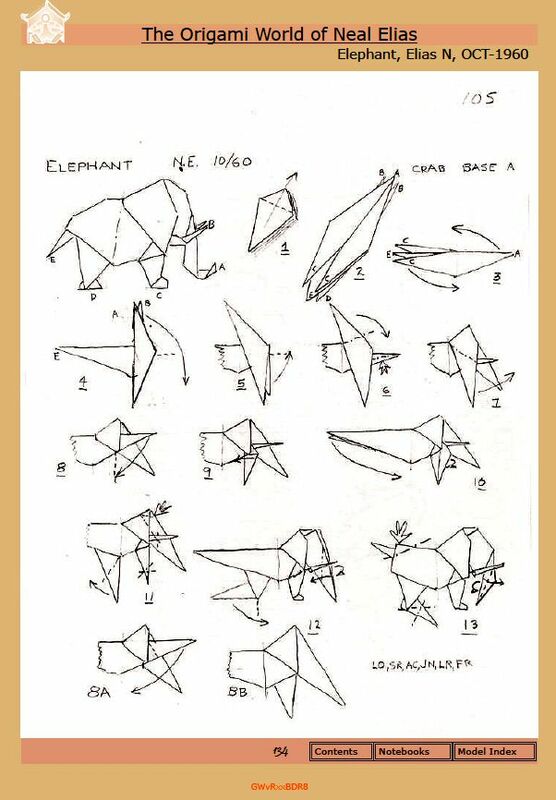 The Origami World of Neal Elias is a remarkable collection of, not only Neal Elias' work, but of the... (Lire la suite) evolution of modern paperfolding. An extremely good collections, I highly recommend it. Very complete collection, good if you liked some of Neal Elias' work and were curious to see more li... (Lire la suite)ke I was. I put 3 stars however because many of them are hard to figure out since they were sketches/brainstorms. 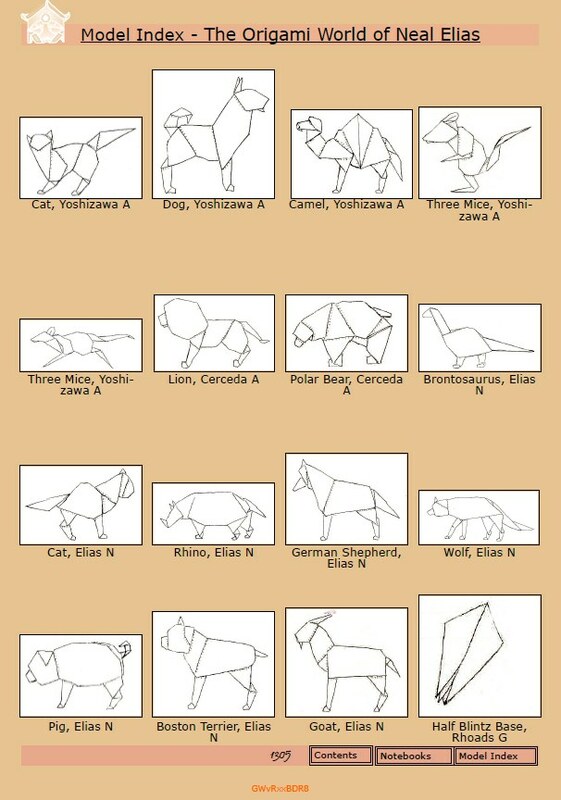 It would've been nice if some hints or missing steps were added, maybe by getting help from the origami community (since there are so many models). Still a nice collection, all his models are astonishing and it's something to take out when you want to challenge yourself. 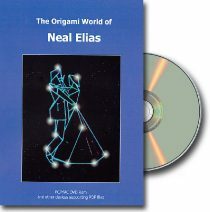 The origami world of Neal Elias is a comprehensive collection of the e... (Lire la suite)ntire works of Neal Elias. It is gathered by Dave Venables and Marc Cooman in one PDF-document. On this DVD youll find a PDF-document containing The Complete Notebooks: diagrams and notes of more than 1000 designs by Neal Elias. And there is more, much more. Under Extras you can find about 40 diagrams of Eliass models drawn by other origamists. Aside from 18 very great diagrams designed by Dave Venables there are also diagrams by among others Robert Harbin (3), Jessie Seto (9, handwritten) and Halle (5) on this DVD. The ones made by Halle are characterized as always by the lovely use of color, humorous style and funny sketches. The main part (more than 1400 pages) of the document consists of The Complete notebooks of Neal Elias. These notebooks were never meant for publication. They are scanned notes of handwritten sketches in pencil on squared paper. So the diagrams are a bit cryptic, but with some origami experience youll figure it out. The complete notebooks include not only diagrams of Eliass own designs (about 1000), but also designs that he collected of origamists whom he admired. He made notes on models of among others Yoshizawa, Legman and Patricia Crawford. Elias maintained an active correspondence with many other origamists. On the notes you still see initials of his pen pals. FR stands for his close friend Fred Rohm, LM for Ligia Montoya, an Argentinian origamist whom he greatly admired and DV stands for Danielle Verbeeten. Haha joke :-), of course Dave Venables with whom he kept a close friendship for 32 years. Elias designed great animals. As for me, Im even a bigger fan of his human figures. He designed over a hundred. 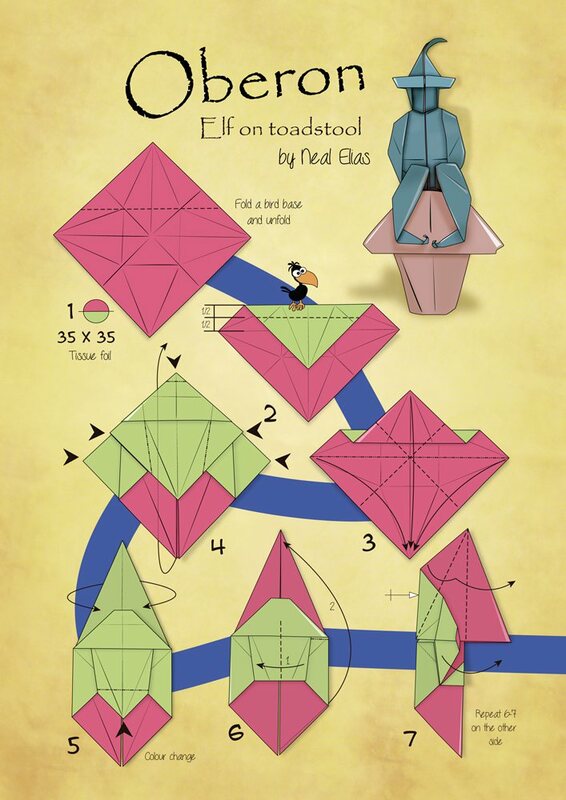 Together with origami friend Fred Rohm, Elias introduced three dimensional folding. Also with Fred Rohm, Elias experimented with multi object models, which he is so famous for. The experimenting lead to models like: Llopios moment of truth, a bullfighter, a bull and the bullfighters cloth folded out of one single sheet of paper, Motherlove, a mother bending over a pram and for example and Last Waltz, a dancing couple. Elias developed his own way of folding human arms. A maneuver now known as the Elias stretch. The style we associate with Eliass origami is boxpleating. Elias stresses that he was not the inventor of this technique. He says he felt inspired by Moosers train, got interested and explored the possibilities. Neal Elias is also known for his three-dimensional busts. He designed more than 100 recognizable busts including Shakespeare, Napoleon and Lincoln. After his busts period his creativity faded. Elias still kept in touch with the origami world but designed no more models after 1975. Neal Elias lived (1921-2005) in Cleveland, Ohio. At first he was, like many other origamists- interested in magic. Late 50s he was working at a magic store. In this store he got hold of the book: Paper Magic by the famous Harry Houdini. This book contains diagrams of the flapping bird and the jumping frog. And Neal Elias was fascinated! (later on he married Betty, the daughter of the owner of the shop). The DVD of course has loads of biographic information. 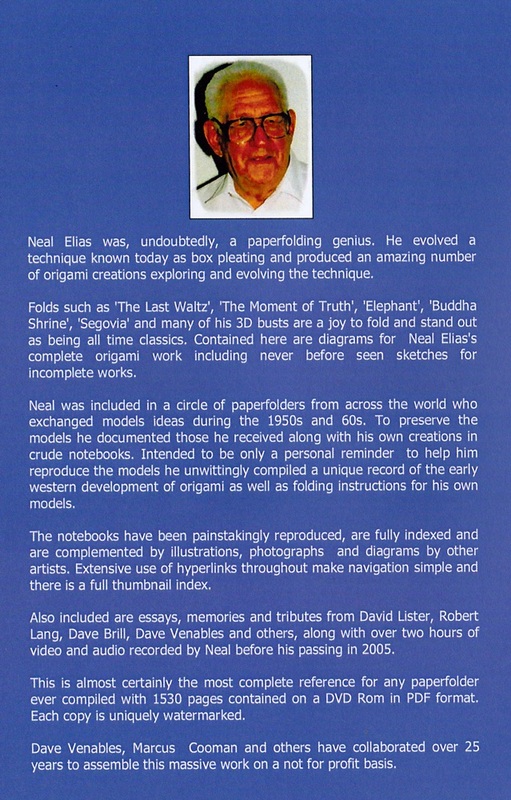 In a 13 page article David Lister tells us about who Neal Elias was, how he worked, how he thouhgt about origami, with whom he was corresponding and by whom he was influenced. Numerous other origamists (including Dave Brill, Robert Lang) share their warm memories of the origami master. His granddaughter wrote a piece showing that he was the best grandfather ever. There is a lot of information on this incredible DVD. You could easy get lost (in a nice way) in all the details. Fortunately, you can use the contents button, on the bottom right to go back to the table of contents. From there you can click on any topic that interest you and click, and click and click on. For me as a fan of Neal Eliass models, this DVD is a wonderful and important document. Using Eliass personal notes and thanks to all the information of others a very large and important chapter in the history of origami is revealed to me. I feel it is an honor to have been able to make a small contribution with the Bull folding stop motion movie, to this opus. Huge thanks to the master and of course to Dave Venables and Marc Cooman!